In that exchange an entire relationship revealed itself to me, both characters people that I fully understood. From there, the book grew outward into Damon (the comic) in adulthood and Damon in childhood, and Poppa, the repository of everything I wished that someone had taught me when I was starting out as a comic, everything I figured out on my own. Review Fix: How did writing for the Tonight Show help this book? Brody: Writing as a freelancer for the Tonight Show helped with all of my humor and comedy writing. Partly, it just got me into the habit of writing jokes every day as a craft, rather than going at it willy-nilly when inspiration struck as I had largely been doing before that. More than that, though, because I had to submit my jokes for Jay on paper, I needed to learn how to make a joke play well on the page, and I had to learn to tailor the voice of jokes to the man who would be performing them. I had begun to learn this earlier, writing for Fritz Coleman’s two series on local NBC in the late 80s and early 90s, for Byron Allen’s local show and for a pilot called A Different Point of View, and one for Mark Decarlo as well. Straight-ahead joke writing to a particular character voice proved very important in Laughs Last as I needed to be able to build out segments of Damon’s act that were clear enough and funny enough to imply the existence of a good deal more material and that would allow us to believe the moments when he improvises new material in his own voice. Without the time writing for Jay, I don’t know that I would have really had any sense of where to begin with some of those segments. Brody: This is a book for people who go to comedy clubs hoping to see smart comics. If you love comedy as entertainment or as art, you’ll find a lot here to draw you in, or if you’ve dreamed of trying stand-up comedy yourself. Also Jews. I think there’s a lot in the family dynamic of this book that feels culturally Jewish and that I suspect will resonate with Jews in particular. I could be wrong. It could just be that it will resonate with people who have parents or grandparents or who were once children. Review Fix: Who are some authors that have influenced your style? Brody: Unlike my first two books, which were heavily influenced by my Sci Fi and Fantasy favorites, this one I think is most influenced by humor writers like David Sedaris and writers of familial narrative fiction. Augusten Burroughs. J.D. Sallinger shows up in some places in this one, in the simplicity of the dialogue, though I also think there’s a bit of Ann Patchett in the narrative style. I draw on everyone and everything I read, so I wouldn’t be surprised if there’s some Marvel Comics in there as well, somewhere. Brody: I would love for this book to be remembered by readers as the funniest, sweetest thing they’ve ever read. By society…? As the greatest work of fiction in the history of man. Perhaps that’s arrogant. As the greatest work of humorous fiction in the history of man. 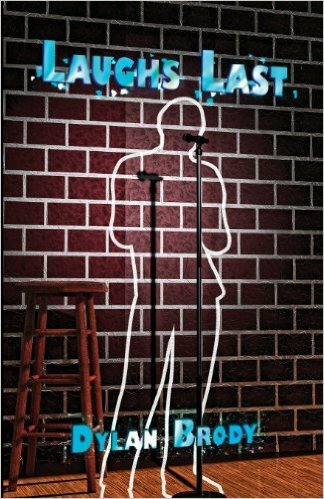 Brody: The beauty of this book lies in its willingness to give civilians a look behind the curtain and the world of stand-up comedy that nobody gets to see. I remember hearing Robin Williams’ piece “Come Inside my Mind” when I was a beginning comic in the early eighties; it struck me with its difficult, unironic look at what goes on in the comic’s head when the show suddenly doesn’t feel as though it’s going well. Laughs Last draws on that impulse, revealing the inner-workings not just of the comedy clubs and the craft behind stand-up comedy, but of the mind that lives to find the punch line, the mind that cannot help but find the punch line no matter how tragic or challenging the set-up. Review Fix: Bottom line, why should someone buy this book? Brody: This book is funny and poignant. Buy this book to enjoy reading again the way you used to when your parents yelled at you for reading at the dinner table. Your grandfather’s love lives in this book, and your mother’s laugh, and a good deal of laugh-out-loud delight. Brody: I’ve just signed a deal with Blue Panther for a 2017 international tour of my solo show Dylan Brody’s Driving Hollywood, and in the meantime I’ll be writing for television, pitching series, and spending time with my two dogs, Sir Corwin the Beautiful Dog-faced Dog, Brindled Beast of Sylmar and Lord Buckley Sweetlips, Greatest of All Dane Mutts (The Dinosaur Slaying Dog), my turtle Sheldon Maurice Turtlestein Brody and my lovely wife whose name escapes me at the moment.